On clearing the glen we reach the pretty hamlet of Delgany, with its Gothic church picturesquely situated on the side of a romantic hill; and about three miles further south we arrive at the village of Newtown Mount Kennedy, which, from its position in the centre of a tract of beautiful country, is generally made a point d'appui, from whence the tourist may visit at his ease the several objects of interest in its neighbourhood. The most remarkable of these is the wild ravine called "The Devil's Glen," a combination of rock, wood, and water, sufficiently beautiful to entitle this delightful spot to have been named with greater propriety the "Glen of the Gods." Inferior in majestic character to the Dargle, and destitute of the softness mingled with grandeur of the highly-adorned Glen of the Downs, it is marked by a combination of pictorial objects blended in forms unknown to either of those districts. The River Vantrey forms at THE HEAD OF THE DEVIL'S GLEN a fine fall of one hundred feet in height, in an unbroken descent, which is not exceeded in beauty by any waterfall in Ireland. We know no spot better suited for the indulgence of deep meditation than this solitary and secluded glen. It has been the cradle of an accomplished poetess, for at a short distance is Rosanna, the home of Mrs. Tighe, the amiable and highly-gifted author of "Psyche," one of the most graceful poems in the language. 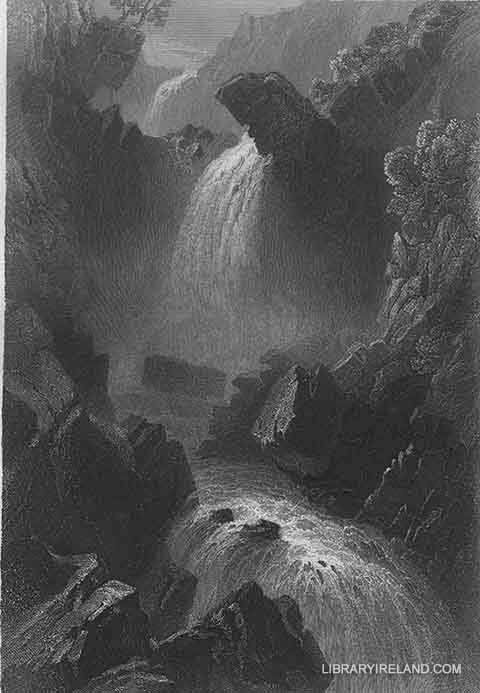 The romantic pass of Dunran, in this vicinity, should not be unvisited by the tourist; it is one of the sublime gems which enrich the eastern part of the county of Wicklow, and though it assimilates with the general character of the magnificent scenery of the district, it possesses individual attractions to amply compensate the labour of ascending the eminence from whence it may be advantageously viewed.